Thank you very much.1 I appreciate the invitation to speak to you as part of today’s SUERF conference on “Globalization Dynamics: EU and US Perspectives.” With events like these, the SUERF aims to foster an active network between professional economists, financial practitioners, central bankers and supervisors.2 Ongoing dialogue between these groups is important to the efficient and effective implementation of monetary policy, and I am glad to have the opportunity to make a small contribution to that dialogue. Just a few weeks ago, the Federal Open Market Committee (FOMC) announced that it would begin to passively reduce the size of its securities portfolio. This announcement marks the beginning of a multiyear effort to bring the Federal Reserve’s balance sheet to its longer-run size. In my remarks today, I’d like to offer my views on this policy from a financial markets perspective. The message I’d like to leave you with today is one of confidence. I am confident that the FOMC’s plan will reduce the size of the portfolio in a gradual and predictable, “no surprises” manner. I am confident that the FOMC’s plan will promote good market functioning in the Treasury and agency mortgage-backed securities markets as the portfolio declines, and that it will not prove disruptive to the U.S. mortgage market or the U.S. Treasury’s debt management program. And I am also confident that the plan’s design, and the FOMC’s clear communication prior to the plan’s implementation, will mitigate the risk of sharp or outsized asset price reactions to the decline in the portfolio’s size over time. I want to expand on this last point. We cannot and should not prevent Treasury and MBS prices from reacting to relevant economic and financial developments, or indeed from gradually moving over time in response to the progressive decline in the size of the Federal Reserve’s holdings and consequent increase in the amount of securities held by the private sector. In fact, we actively want asset prices to respond appropriately and fully to economic and financial news. Over the coming years, such news could span a wide variety of topics, such as central bank policy in this country and abroad, the ongoing debate over fiscal policy, and the evolution of expectations for the longer-run neutral rate of interest. That said, we do seek to mitigate the risk that our operational actions contribute to unnecessary surprise, disruption, or volatility. I am confident that the FOMC’s plan appropriately manages this risk. Now, confidence doesn’t mean certainty: there is always a risk that events could unfold differently from expectations. In particular, central banks have had little directly relevant past experience with the impact of such a reduction in holdings of domestic securities and in reserves. One relevant experience, of course, was the 2013 “taper tantrum,” which shows that markets can have outsized reactions to changes in balance sheet policy even before they happen. Moreover, experience with asset purchase programs, both here and abroad, clearly demonstrates that market volatility can ensue from balance sheet policy changes that market participants perceive as surprising, unclear, or rapid. All of this indicates to me that, at policy turning points like these, central banks should carefully and clearly communicate their intentions, provide as much transparency as possible, and make transitions in policy implementation as slowly as overall macroeconomic policy objectives permit. Policymakers have made it clear that balance sheet normalization is intended to operate in the background, and that the bar is high to making changes to the FOMC’s normalization plan. That said, the future is uncertain, and as a result the Desk will maintain an appropriate set of capacities should the FOMC deem something different be required to promote the Federal Reserve’s objectives. We will also continue to gather market intelligence, including through surveys of primary dealers and market participants and through a robust set of statistical data collections, to further policymakers’ understanding of market participants’ expectations for the balance sheet and to monitor market functioning. The rest of my speech will go as follows. First, I’ll provide an in-a-nutshell summary of the structure of the Federal Reserve’s balance sheet. Then, I will discuss why it is important that the decline in the balance sheet be gradual and predictable, and explain how the FOMC’s plan provides this gradualism and predictability. I will then talk briefly about how the Federal Reserve is ensuring it is operationally prepared for unexpected developments. And then I’ll conclude on a slightly different note: I’ll offer my thoughts on why financial markets seem to have reacted much more calmly to balance sheet news this year than they did during the 2013 “taper tantrum” period. Let’s begin by reviewing, at a high level, where the Fed’s balance sheet is today, and where it is likely to go in the coming years. Although many things about monetary policy are very complex, the basic structure of the balance sheet is actually fairly simple, as is the program of balance sheet normalization. Panel 1 shows a summary of the Fed’s assets and liabilities, as they are today. Substantially all of the $4.5 trillion of assets consist of Treasuries and agency MBS.3 On the other side of the balance sheet, the Federal Reserve has three main categories of liabilities: $2.6 trillion of bank reserves and other deposits, $1.5 trillion of paper currency, and about $400 billion of reverse repos. In addition to being larger than it was before, the balance sheet has a significantly different composition than before the crisis. On the asset side, the most important change has been the addition of agency MBS. For many years, the FOMC has made it clear that it did not intend for the balance sheet to remain at this size forever.5 Instead, through its statements and its Policy Normalization Principles and Plans, it has indicated its intention that the Federal Reserve will, in the longer run, hold no more securities than necessary to implement monetary policy efficiently and effectively, and that in the longer run it will hold primarily Treasury securities. Starting in its December 2015 statement, the FOMC also indicated that it anticipated continuing reinvestment until normalization of the level of the federal funds rate was well under way. The FOMC also indicated, starting in its September 2014 Policy Normalization Principles and Plans, that it intended to reduce the Federal Reserve's securities holdings in a gradual and predictable manner primarily by ceasing to reinvest repayments of principal on its securities holdings. From an accounting perspective, the decline in the balance sheet will, at a high level, resemble a mirror image of its earlier increase. We should of course expect to see the amount of assets decline, and this will be matched by a decline in the overall stock of liabilities. Most of this decline in liabilities will likely take place as a decline in bank reserves. The size of the balance sheet will be “normalized,” in Federal Reserve parlance, when the FOMC judges that the Federal Reserve is holding no more securities than necessary to implement monetary policy efficiently and effectively. At that point, the size of the balance sheet might well be “normalized,” but its composition will probably not be. Panel 2 shows a stylized summary presentation of how the Federal Reserve’s assets and liabilities might look when the size of the balance sheet is normalized, drawn from the “median scenario” included in the July 2017 update to our annual report, “Open Market Operations During 2016.” This presentation is largely based on the median of market participants’ surveyed expectations collected in June, along with some staff modeling to fill in the details, and as such is not an FOMC projection or forecast. That said, it provides a useful way to illustrate my point. In theory, reducing the size of the balance sheet is quite simple. There are two ways to go about it.10 One approach is to simply let securities holdings mature. Principal matures on the Fed’s securities holdings all the time: Treasury bonds mature at specified dates, and agency MBS principal is repaid over time as home loans are paid back.11 For the past several years, the securities portfolio has been maintained at a steady level by reinvesting these principal repayments.12 This activity can be reduced or stopped. A second approach is to simply sell securities on the open market, using a similar procedure to the way the securities were purchased to begin with. Either way, the securities end up back in private hands. This is obvious in the case of sales. When we don’t reinvest principal repayments on Treasuries, the securities the Federal Reserve would otherwise have bought end up in private hands instead. And when we don’t reinvest agency MBS principal repayments, this means that any new mortgage that was taken out to fund those repayments ends up being sold to private investors. While the mechanism varies, the end result, in theory, is largely the same. So how should the Fed implement a reduction in the balance sheet size? The approach should underscore that the balance sheet will be reduced in a way that is gradual and predictable, so as to credibly assure market participants that the balance sheet will decline in a way that avoids surprise, disruption, or volatility. As part of this, it should be simple, and easy to communicate to the public. The FOMC’s plan for normalizing the balance sheet does exactly this.13 It decreases principal reinvestment, an approach which provides for an appropriate pace of reduction in the balance sheet and is quite straightforward to communicate. It accomplishes this by reinvesting principal maturities only to the extent that they exceed gradually increasing caps.14 For Treasuries, the cap will be $6 billion per month initially and will increase in steps of $6 billion at three-month intervals over 12 months until it reaches $30 billion per month. Agencies follow a similar pattern, starting at $4 billion and rising in three-month steps to $20 billion. The FOMC also indicated that it anticipates that these caps will remain in place once they reach their respective maximums. Let me spend a few minutes discussing the importance of gradualism and predictability, and how the FOMC’s plan achieves these things. To examine the importance of gradualism, we will need to open, once again, the theoretical debate about “stock” and “flow” effects of central bank asset purchases and sales.15 Under the “stock view,” transitions in the pace of central banks’ asset flows should have little direct effect on asset prices. Instead, what matters to asset prices is the present and expected future stock of assets the central bank holds, or is anticipated to hold. The “flow view” suggests instead that the effect on asset prices relates to the pace at which assets are being added or removed from the balance sheet at that time. Many speeches have been given, and journal articles published, about the relative importance of these effects with respect to their impact on financial conditions and the broader economy, a topic that I do not intend to wade into today.16 Instead, I think it’s important to make a few points on “flow effects” relevant to policy implementation, and in particular related to possible “flow effects” associated with an overly rapid pace. A sustained portfolio runoff at an overly fast pace could also shrink the balance sheet so quickly that it impacts other aspects of monetary policy implementation. Rapid portfolio declines could have unforeseen impacts on overnight money markets, for example by creating significant shifts in dealers’ demand for overnight repo financing. We have seen such impacts in the past. During the Maturity Extension Program, the Federal Reserve sold substantial amounts of shorter-dated Treasuries. Some of these securities accumulated in dealers’ inventories, and secured financing rates rose a bit as dealers sought to finance these holdings. This sort of volatility did not, and would not now, pose a major problem to markets or policy implementation, but it is something worth avoiding if possible. Rapid portfolio runoff could also make it more likely that bank reserves become scarce unexpectedly or more quickly than policymakers had anticipated. Finally, overly fast portfolio runoff could introduce undesired noise into financial conditions. Policymakers have indicated that they want the portfolio’s size to decline “in the background,” and that the federal funds rate be the primary instrument of monetary policy. Rapid portfolio runoff could lead market participants to overestimate the total decline that will occur in the Federal Reserve’s securities holdings, and thereby accelerate the rise in term or mortgage risk premia associated with balance sheet normalization. This could complicate policymakers’ economic forecasting and make it more challenging to determine and communicate the appropriate monetary policy stance. The FOMC’s plan addresses these concerns about gradualism in two ways. First, it begins at a low rate of redemption, increases this slowly and in small amounts, and then continues at a specified maximal rate of runoff. These amounts should result in transitions that are within the market’s capability to absorb. Second, because the plan explicitly and numerically communicated the FOMC’s plans, it should promote stability in market estimates for the future size of the balance sheet, and confidence that the FOMC will not unintentionally create market stress. The second goal is to provide the public with a degree of certainty that, as the Federal Reserve reduces reinvestment, the market will not be asked to absorb securities at a speed that unexpectedly changes in a significant way. I’ve already discussed why it is important that the flow of securities back into the market be gradual. Predictability is about ensuring that the flow is gradual across economic scenarios, including scenarios that are quite different from our central forecast. Achieving this predictability is complicated by uncertainty about agency MBS principal repayments, an issue I’ll summarize briefly. To an extent, mortgage payoffs are driven by the white noise of life, such as homeowners selling their homes as they find new jobs in different areas of the country, have children, or retire, and in the process pay off the mortgage on their old house. There is some uncertainty about how social and demographic factors like these will impact the housing market over the long term, and this therefore creates uncertainty in long-term MBS prepayment forecasts. Over the short term, however, by far the greatest source of aggregate uncertainty in mortgage principal repayments relates to refinancing, the process by which homeowners get a new mortgage with a better interest rate, and pay off their old one in the process. Refinancing results in existing agency MBS, containing the old higher-rate loans, being paid off more quickly, along with greater issuance of newly-minted agency MBS containing the new, lower-rate loans. Homeowners are incentivized to refinance when mortgage rates decline below the rate on their current loan. In contrast, most market participants expect longer-term interest rates, including primary mortgage rates, to rise over policy normalization, and that therefore mortgage refinancing activity will be modest. As a result, most expect mortgage principal repayments to run below the level of the redemption cap set by the FOMC. Projections for these repayments, drawn from the July 2017 update to our annual report that I discussed earlier, are shown in left-hand side of Panel 3. The benefit of the cap, even though it is unlikely to bind, is that it limits the amount of variation in the pace at which securities, and particularly mortgages, will flow back into private hands. Recall that the left-hand figure in Panel 3 is based on rising interest rates over an ongoing economic expansion. For comparison, the right-hand figure in Panel 3 shows the projected MBS principal repayments for a scenario in which interest rates come in two percentage points below market participants’ expectations. In this scenario, the cap operates to constrain the flow of securities into the market. While such a lower-rate outcome is not a central expectation, it is certainly possible. By providing market participants some certainty that the pace of balance sheet decline will be gradual across economic scenarios, this plan should help mitigate the risk of unexpectedly sharp shifts in asset prices, liquidity, or market functioning should markets begin to put greater weight on lower interest rate scenarios. Indeed, by promoting greater confidence in the stability and liquidity of the Treasury and agency MBS markets across economic outcomes, the FOMC’s plan should result in lower risk and liquidity premia on these assets relative to normalization plans that do not promote such confidence. The importance of predictability is underscored when one considers that in recent years, adverse economic shocks have generally been associated with sharp falls in longer-term interest rates. Such declines would tend to bring about faster MBS repayments and, if the outflow from the Federal Reserve’s portfolio were not constrained by a cap, an unforeseen tightening effect on financial conditions, amplifying the adverse shock. So long as the plan I’ve described to you proceeds uninterrupted and as expected toward normalization, it is likely that policymakers’ operational demands on the Desk will be considerably lighter than they have been over the last decade. However, it is possible that unexpected developments in the economy may require a change of plans. For example, the FOMC has made it clear in its addendum to the Policy Normalization Principles and Plans that it stands ready to resume reinvestment if a material deterioration in the economic outlook were to warrant a sizable reduction in the federal funds rate. The FOMC also indicated that it would be prepared to use its full range of tools, including altering the size and composition of its balance sheet, if future economic conditions were to warrant a more accommodative monetary policy than can be achieved solely by reducing the federal funds rate. You may recall that Chair Yellen reiterated these points in her press conference following last month’s FOMC meeting. Likewise, while the principles and plans do not indicate an expected role for asset sales in portfolio normalization, except in that limited sales might be warranted in the longer run to reduce or eliminate residual holdings of agency MBS, the operational capability remains, even though we do not expect it will be needed. I noted earlier that my confidence that the FOMC’s plan for balance sheet normalization was in part due to its clear communication: the gradual and predictable nature of the balance sheet decline should help ensure that market participants’ expectations remain well aligned with what eventually transpires. In my view, a “trust, but verify” approach is called for to ensure that this confidence is appropriate. While I trust that the program design will keep expectations for the portfolio realistic, I believe that a robust analytical mechanism to verify this, underpinned through continuous market monitoring, broad-based surveys of primary dealers and market participants, and a diverse suite of statistical data collections, will help ensure that policymakers can detect early and respond promptly to situations where market participants expect the portfolio to evolve significantly differently from policymakers’ expectations. The idea is simple: keeping these two sets of expectations aligned should help prevent the risk that they get very far apart, an adjustment has to take place, and there is large move in asset prices. But the experience of the 2013 “taper tantrum,” when asset prices moved sharply and unexpectedly following former Chairman Bernanke’s announcement of an eventual cessation in asset purchases, poses some questions about doing this in practice. What might have caused the taper tantrum, and why have financial markets been so much more stable in comparison this time around? I think there is truth to this, but I wonder if there is more to the story. We now survey a broad community of investors in addition to the primary dealers in a bid to gather a more diverse and inclusive perspective, partly in response to this concern. While this makes our surveys more robust, since we started doing this we haven’t observed large differences in median responses between the dealers and the buy-side community. 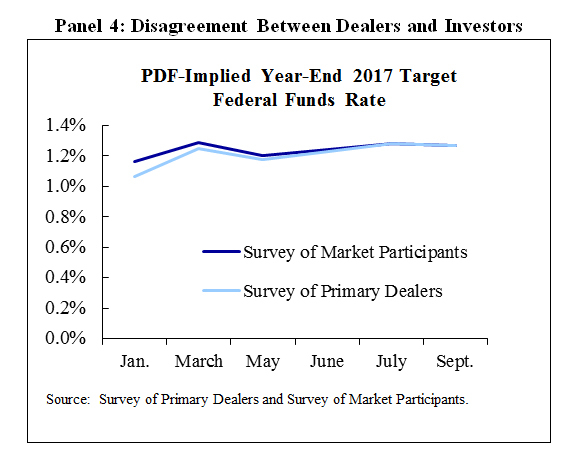 As an example, Panel 4 shows a time series of the expected level of the federal funds rate at the end of 2017 for dealers and for buy-side firms; these two track each other closely.22 On the other hand, both the dealers and buy-side community responses exhibit substantial dispersion around these medians. One explanation for the adverse reactions to Federal Reserve communications in the spring of 2013 is that the marginal investor is not the same as the median respondent to our surveys. Looking past the survey, I think there are a few key factors that differ between now and 2013 that might explain why the market reaction has been so much calmer this time. The macroeconomic environment is markedly better. Market participants have a better sense for the FOMC’s approach to increasing the federal funds rate, and there is much greater clarity on the respective roles of the balance sheet and the overnight policy rate. The normalization plan is more clearly gradual and predictable. And the balance sheet news this time around may just not have been all that surprising. I’ll talk briefly about each of these. A related possibility is that in the current situation expectations for a very gradual program of increases in the federal funds rate are relatively well entrenched, with liftoff more than a year and a half behind us. In 2013 market participants were focused on policies that would add more accommodation. Under the “recruitment effect” proposed by former Governor Jeremy Stein and Sam Hanson of Harvard Business School, yield-oriented investors react to lower short-term rates by “reaching for yield” into longer-dated maturities, and reverse this effect when short-term rates rise. These effects can be even larger when balance sheet policies are in active use.24 As a result, a shock to expectations of the central bank’s reaction function can lead to outsized movements in longer-term rates. The FOMC’s current approach entails a much clearer delineation of the roles of the federal funds rate and the balance sheet, breaking the link that appeared in the spring of 2013: the association between a reduction in the balance sheet and a shock to expectations for the federal funds rate. 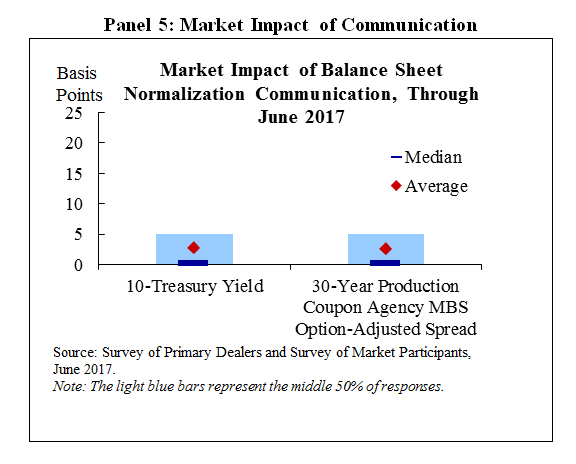 As shown on Panel 5, even with the active discussion of balance sheet normalization in the March and May 2017 FOMC meeting minutes, market participants attributed very little of the movement in longer-term rates to communication from the FOMC regarding potential changes in their reinvestment policy. It’s also possible that it is especially important for the FOMC to act in a gradual and predictable way at times when investor response to Federal Reserve announcements might not be expected to follow predictions that come from economic models that assume rationality, perfect information, expectations for continuously optimal policymaking, and so on. George Soros’s theory of reflexivity might be instructive here. Soros’s framework is based on two propositions: fallibility, which means that market participants’ views of the world can never perfectly correspond to the actual state of affairs; and reflexivity, which means that these imperfect views can influence the situation through the actions of those who hold those views.25 In other words, perception might not correspond to reality, but perception can influence reality. Taking this to the monetary policy context, expectations for disruption or volatility from an substantial change in the Federal Reserve’s operational posture, even if totally unfounded, could bring about disruption, as the holders of those expectations act to protect themselves or profit from what they believe is likely to come. The solution is to try to avoid generating such expectations for disruption to begin with, by acting gradually and predictably. Another potential explanation for the relative stability of longer-term rates this time around is that balance sheet news this year, taken together, just hasn’t been all that surprising to market participants. Panel 6 shows market participants’ expectation for the level of the federal funds rate that would prevail when the reinvestment policy first changes, as well as expectations for the date of that change. As can be seen, balance sheet normalization started slightly earlier than expected, both in rate terms – it began with the federal funds rate at 1.16 percent – and, more notably, in terms of the absolute date. But at the same time, earlier in the year, many market participants had seen decent odds that the Federal Reserve would reduce its balance sheet more quickly with a full-stop end to reinvestment. Panel 7 shows the decline in expectations for both no change in Treasury reinvestments and a hard-stop in them. It seems likely that these shifts in expectations came as the FOMC’s communications became increasingly granular, particularly after the June meeting at which the FOMC provided detail on its balance sheet normalization plan. On net, it seems likely that expectations for the Federal Reserve’s overall stock of asset holdings were fairly stable over this time, despite variation in expectations for the timing and pace of eventual declines. Under the “stock view,” this stability in expected future asset holdings should result in limited changes in asset prices, as has been observed. Of course, as the balance sheet shrinks, some upward pressure on rates should be realized. Market participants’ estimate of this effect over two years is shown in Panel 8. One last possible explanation for the stability of longer-term interest rates amid the movement toward balance sheet normalization has been the FOMC’s clear message that it would be prepared to use its full range of tools, including altering the size and composition of its balance sheet, if future economic conditions were to warrant a more accommodative monetary policy than can be achieved solely by reducing the federal funds rate. Panel 9 shows the average of survey respondents’ probability distributions for the balance sheet; the left side shows this for the scenario where overnight rates remain away from zero, and the right side shows the adverse scenario in which they do return to zero. The right side shows a significant expansion in the balance sheet. As shown in Panel 10, market participants assign about one chance in four to such a scenario unfolding, so communications about how the FOMC might respond to such an outcome in the future might have the effect of bolstering confidence even today. Returning to Panel 9, it is notable how much uncertainty there is about the size of the balance sheet, even in the no-zero-lower-bound scenario shown on the left. This likely reflects a few factors: MBS repayments remain uncertain up to the cap; future demand for currency, bank reserves, and non-reserve liabilities is hard to know precisely; and the FOMC has not yet decided on a longer-run framework for the implementation of policy. As a result, it seems appropriate to me that there should be an appreciable amount of uncertainty, which should decline over time as these matters become clearer so long as normalization continues uninterrupted. Clearly, the 2013 taper tantrum should leave any observer cautious in assessing a central bank’s ability to normalize its balance sheet smoothly. Those of us who work at the Federal Reserve certainly were. I believe the FOMC’s plan carefully takes into account the range of potential explanations for the taper tantrum, in particular through its emphasis on gradualism and predictability. Early signs on this front are encouraging, with financial market volatility around recent balance sheet announcements quite modest relative to what we saw in 2013. It’s much too early to declare success. However, should this stability continue, I believe the FOMC’s approach may offer useful lessons to other central banks which anticipate reaching a time of transition in their policy stance. In particular, the FOMC has aimed to provide as much transparency as it can in an effort to underscore its intent to achieve an uneventful normalization of the balance sheet. I believe that this level of transparency has been of great importance. 1 I would like to thank James Egelhof for his assistance in the preparation of these remarks, Adam Biesenbach and Romen Mookerjee for their assistance with data, and colleagues in the Federal Reserve System for numerous insightful comments and suggestions. 2 Additional information about SUERF is available on its website, https://www.suerf.org/. 3 The amortization of premiums on portfolio securities holdings results in downward pressure on the size of the Federal Reserve’s balance sheet over time, even absent a reduction in reinvestments associated with increasing redemption caps. Specifically, the balance sheet includes securities holdings at face value and records unamortized premiums (discounts) as a separate asset (negative asset). As the premium (discount) security amortizes to its par value—with an associated offsetting reduction (increase) in remittances to the U.S. Treasury—the size of the balance sheet declines (increases). 4 The maturity structure of the balance sheet was only loosely incorporated into the purchase plan. Purchases of Treasury securities were targeted at maturity sectors; within each sector, specific issues were selected for purchase using a relative-value approach based on a spline fitted to market prices. Sack, Implementing the Federal Reserve’s Asset Purchase Program, February 9, 2011. Treasury securities acquired through reinvestment are allocated in proportion to issuance. Agency MBS purchases are distributed across instruments roughly in proportion to anticipated gross issuance of those securities at the time. Potter, The Implementation of Current Asset Purchases, March 27, 2013. 6 See Potter, Money Markets at a Crossroads: Policy Implementation at a Time of Structural Change, April 5, 2017, for an assessment of the efficacy of these tools. 7 Currency in circulation has risen steadily for decades. A simple assumption is that currency outstanding will grow in line with nominal U.S. gross domestic product. However, it is easy to imagine shocks that could materially affect currency growth, either positively or negatively. For example, with heavy usage of large-denomination U.S. paper currency overseas, demand for dollars appears sensitive to changes in global growth and financial and geopolitical stability. In addition, it is hard to know what implications new financial technology, generational shifts in preferences about payment modalities, and other longer-term factors will have on currency demand. 8 “The Committee currently anticipates reducing the quantity of reserve balances, over time, to a level appreciably below that seen in recent years but larger than before the financial crisis; the level will reflect the banking system’s demand for reserve balances and the Committee’s decisions about how to implement monetary policy most efficiently and effectively in the future. The Committee expects to learn more about the underlying demand for reserves during the process of balance sheet normalization.” See the Addendum to the Policy Normalization Principles and Plans, June 13, 2017. Minutes to the FOMC’s November 2016 meeting summarize the FOMC’s discussion of its long-run framework and its implications for the long-run balance sheet size. 9 Logan, Implementing Monetary Policy: Perspective from the Open Market Trading Desk, May 18, 2017. 10 See Leonard, Martin and Potter, How the Fed Changes the Size of Its Balance Sheet, July 10, 2017, for detail on how these transactions work in practice. 11 Interest is not reinvested. Instead, the Federal Reserve’s net income is remitted to the Treasury. 12 This is done by placing noncompetitive add on bids at Treasury auctions and by buying agency MBS on the open market. 13 The Policy Normalization Principles and Plans indicates that all FOMC participants but one agreed that they did not anticipate selling agency mortgage-backed securities as part of the normalization process, although limited sales might be warranted in the longer run to reduce or eliminate residual holdings, and that the timing and pace of any sales would be communicated to the public in advance. Portfolio projections released in July 2017 do not include sales of any type over the forecast horizon. 14 Statement Regarding Reinvestment in Treasury Securities and Agency Mortgage-Backed Securities, September 20, 2017. 15 See, for example, Sack, The SOMA Portfolio at $2.654 Trillion, July 20, 2011, and Bernanke, The Economic Outlook and Monetary Policy, August 27, 2010. 16 See Bonis, Ihrig and Wei, Projected Evolution of the SOMA Portfolio and the 10-year Treasury Term Premium Effect, September 27, 2017. 17 Kandrac, The Costs of Quantitative Easing: Liquidity and Market Functioning Effects of Federal Reserve MBS Purchases (2014). 18 The Treasury Borrowing Advisory Council considered this topic in its third-quarter 2017 meeting, including the potential impact of changes in central bank policy abroad. See the August 1, 2017, presentation by TBAC to the U.S. Treasury. 19 In addition to these topics, we are following closely the potential for the decline in the balance sheet to affect other aspects of the structure of financial markets or the banking industry. As one example, we are paying attention to the possibility that a decline in the size of the balance sheet puts downward pressure on bank deposits. As discussed earlier, in general, balance sheet normalization removes an asset from the private sector that can be held only by banks (reserves) and replaces it with an asset that can be held by anyone (securities). It is possible that, on net in equilibrium relative to a counterfactual in which the balance sheet does not decline, (a) banks will hold fewer reserves; (b) banks will offset some of this decline by holding securities instead, and some by taking in fewer deposits; and (c) non-banks will replace those deposits with securities. The extent (if any) of any such decline in deposit activity on deposit and loan pricing will likely depend on a variety of factors, including the extent to which the decline comes from wholesale institutional deposit activity motivated by interest rate arbitrage. See Ihrig, Mize, and Weinbach, How does the Fed adjust its Securities Holdings and Who is Affected?, September 22, 2017. 20 In fact, following the June 2013 FOMC meeting, the dealer survey revealed a shift in expectations toward a more accommodative balance sheet stance over time. Prior to that meeting, most survey respondents had seen significant odds that the FOMC would eventually use sales of agency MBS as part of its normalization strategy. During the post-meeting press conference, Chairman Bernanke stated “While participants continue to think that, in the long run, the Federal Reserve’s portfolio should consist predominantly of Treasury securities, a strong majority now expects that the Committee will not sell agency mortgage-backed securities during the process of normalizing monetary policy, although in the longer run, limited sales could be used to reduce or eliminate residual MBS holdings.” Surveys conducted after this meeting revealed no expectation for agency MBS sales, and for the portfolio to be larger over time as a result. 22 These figures include results from the Desk’s September Surveys of Primary Dealers and Market Participants. The results from these surveys will be released tomorrow on the New York Fed’s website. 24 Stein, Yield-Oriented Investors and the Monetary Transmission Mechanism, September 26, 2013. 25 This description is drawn from Soros, Fallibility, Reflexivity, and the Human Uncertainty Principle, Journal of Economic Methodology, January 2014.